There’s a great sense of satisfaction when you come across the needle you have been looking for in a haystack of files. For me, the greater thrill is the unexpected gem that leads down new tracks and expands the horizons of the picture you are trying to put together. More often than not, those leads prove the rule of six degrees of separation. 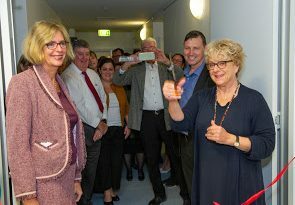 The track that brought me to have the honour to cut the ribbon at the opening of a new repository the University of NSW Canberra. In 1970, my father, Brian Beddie, left the ANU to take up the Foundation Chair in Government at the University of New South Wales at Duntroon. He retired in 1984 just before the new campus was opened. He used to quip that he’d spent his whole life in huts, first at Childers Street at the ANU and here in a row of green sheds on the ridge. Last year I received an email from Paul Dalgleish Special Collections Archivist at the Australian Defence Force Academy Library about a set of papers the library had found – documents my father had amassed for various writing projects and lectures. Would I release these to the archive? I didn’t need even to see them to say yes but I did come to Canberra, where I met a tremendous team. We talked for much longer than either side had anticipated. Rose Holley, Special Collections Curator at the library, enthused about her plans for a new archival space. Rarely does one hear these days of an expansion in library storage. Indeed, when my father died in 1994, we couldn’t find a library in Australia willing to take all the books he had collected on Max Weber. We mentioned this to Hans Brunn, who had been a young scholar Brian became friendly with at the Max Planck Institute in Munich in 1968. Hans was by 1994 a senior Danish diplomat – his and my paths had crossed again during the heady days of Baltic independence in the early 1990s. He found a solution. The books became part of the shipment of belongings of someone returning to Denmark from the Danish embassy in Canberra. From Copenhagen the books were sent to Riga, where the university was hungry for tomes to supplement its Marxist-Leninist collections. Paul’s partner is Russian — another connection, made stronger by the fact that a few years after my father’s death I found myself here on this campus doing a research master’s on the missing bourgeoisie of early 20th century Russia. This came about thanks to an introduction by a school friend to an academic working here at the time. Her topic was, remarkably, late Russian imperial taxation systems. Who would have thought such paths would cross at a defence academy in Canberra! Back to that first meeting with Rose, Paul, Annette McGuiness (UNSW Canberra Librarian) and Peter Stanley (research professor in history at Australian Centre for the Study of Armed Conflict and Society). As we spoke about the plans for the archive, I grabbed my chance to tell them about the boxes my partner, Peter Rodgers, and I had stored for over a decade. These were the papers of Peter Hastings, one of the most prominent journalists of his era, my father’s closest friend and Peter’s mentor at the Sydney Morning Herald. Peter had taken the files after Hastings’ death — he had a great book proposal to honour Hastings and his connections with PNG and Indonesia but could not find a publisher. So the boxes stayed untouched and unsorted. I thought if my father’s set of papers qualified for the collection, so would Hastings’. But Rose made it clear I would first have to demonstrate that the papers were interesting enough and in an acceptable condition to be handed over. The archive was a mess but I found enough to prove their significance. Paul has found more gold for the researchers who will soon have access the documents now in miraculous order. As well as material relevant to Australia’s security, the UNSW Canberra Special Collections include many literary files. Last week Nicole Moore (Associate Dean for Special Collections at UNSW Canberra) reminded me that the discipline of English has a long history here. In 1918, Leslie Allen became Professor of English at the Royal Military College at Duntroon. For those of you who know the ANU, Allen is one half, so to speak, of the Haydon/Allen building. Perhaps not surprisingly given the size of Canberra in the middle of last century, the connectivity continues. This track leads to the south coast of NSW. When my mother came to Canberra with Brian in the 1950s, she fell in love with the bush and the coast. She wanted a beach house and started combing the area around Batemans Bay. I gather my father was less enthralled but when he heard that Professor Haydon’s house at Broulee was for sale he mentioned it to her. She bought it and gave us and many others a wonderful haven. Professor Allen also holidayed at the coast, at Mossy Point across the bay from the headland where the Haydon house stood. The story goes that the two professors would sometimes finish their game of chess from their respective houses, signalling their moves using Morse code! Nicole has more to add to the seaside story: she can tell you about the logistics of getting books to Mossy Point for Allen to review when he was on the Literature Censorship Board. Speaking of logistics, Rose told me she has become more knowledgeable than she ever expected to be about road and sea freight during this project, which has demanded precision measurements to ensure the compactuses and even their handles comply with the OH&S rules. She has suggested innovations to the company making the system – like the retractable handles — that will now be made available to other buyers. 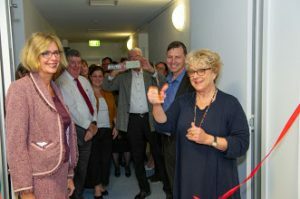 ADFA and UNSW Canberra have come a long way from those green huts to having a state-of-the-art repository. What hasn’t changed is the spirit of inquiry that makes all those files so enticing. We are certainly very lucky that they are in such good hands.